Treacle and Golden Syrup feature so heavily in British baking, especially at times of celebration such as Easter & Christmas, that a brief definition may well be in order before I go any further. Treacle is any syrup made during the refining of sugar and is defined as “uncrystallized syrup produced in refining sugar” Treacle is used chiefly in cooking as a form of sweetener or condiment. Golden syrup is a thick, amber-coloured form of inverted sugar syrup, made in the process of refining sugar cane juice into sugar, or by treatment of a sugar solution with acid. It is used in a variety of baking recipes and desserts. It has a consistency and appearance similar to honey, and is often used as a substitute for people who do not eat honey and can also be used as a substitute for corn syrup. The darker syrup that is usually referred to as dark or black treacle has a distinctively strong flavour, slightly bitter, and a richer colour than golden syrup, yet not as dark as molasses, while molasses has a richer, darker colour than either golden syrup or black treacle and has a stronger, more bitter flavour. Golden syrup was invented in 1883 by Scottish businessman Abram Lyle, when he discovered that a by-product of the sugar cane refined at his factory in Plaistow, east London, could be made into a delicious spread and sweetener for cooking. First sold to Lyle’s employees and local customers in wooden casks, the iconic green and gold tins that Lyle’s golden syrup is sold in today were introduced in 1885. 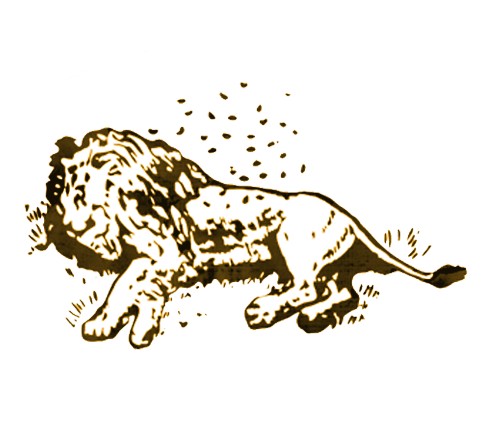 The tin bears a picture of the rotting carcass of a lion with a swarm of bees, and the slogan “Out of the strong came forth sweetness”. While it is not known exactly why this image and slogan were chosen, Abram Lyle was a deeply religious man, and it has been suggested that they refer either to the strength of the Lyle company or the tins in which golden syrup is sold. In 1904 they were registered together as a trademark, and in 2006 Guinness World Records declared the mark to be Britain’s oldest brand. Lyle’s golden syrup was awarded a Royal Warrant in 1911. In 1921 Lyle’s business merged with Tate, a sugar-refining firm founded by Sir Henry Tate in 1859, to become Tate & Lyle. Tate & Lyle is the only cane sugar refiner in the UK and is the largest in Europe. It currently sells a million tins of golden syrup each month. 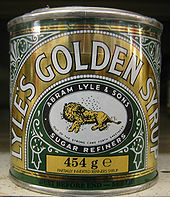 To celebrate the 125th anniversary of golden syrup in 2008, Tate & Lyle sold the product in limited-edition gold tins. Sulphured molasses is made from young sugar cane. Sulphur dioxide, which acts as a preservative, is added during the sugar extraction process. Un-sulphured molasses is made from mature sugar cane, which does not require such treatment. There are three grades of molasses : mild or Barbados, also known as first molasses, dark or second molasses and blackstrap. These grades may be sulphured or un-sulphured. To make molasses, the cane of a sugar plant is harvested and stripped of its leaves. Its juice is extracted usually by crushing or mashing, but also by cutting. The juice is boiled to concentrate it, which promotes the crystallisation of the sugar. The term blackstrap molasses is an Americanism dating from around 1920. The majority of sucrose from the original juice has been crystallized and removed. The calorie content of blackstrap molasses is still mostly from the small remaining sugar content. However, unlike refined sugars, it contains trace amounts of vitamins and significant amounts of several minerals. Blackstrap molasses is a source of calcium, magnesium, potassium, and iron; one tablespoon provides up to 20% of the daily value of each of those nutrients. Blackstrap has long been sold as a health supplement. It is also used in the manufacture of ethyl alcohol for industry and as an ingredient in cattle feed. This entry was posted in Christmas, The Evolution Of . . . and tagged cake, Christmas, Easter, fruit, honey, sugar, traditional, treacle. Bookmark the permalink. 1 Response to The Evolution Of Treacle . . .